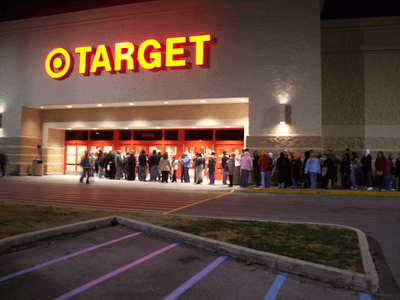 Lines formed overnight and crowds surged into shopping malls and big box stores as the Christmas shopping season began on the day after Thanksgiving, known as Black Friday. Meanwhile, in Israel, ads appeared all over television last Thursday night touting sales taking place in stores on Friday. What name was used to describe that shopping day in Israel? IMGP2667 by djLicious is licensed under CC BY 2.0. Marvel Comics writer Stan Lee died last week at the age of 95. Lee created hundreds of characters including Spider-Man, Iron Man, The Incredible Hulk, Thor, and Ant-Man. Lee intentionally did not identify any of his characters as Jewish, though he noted how Judaism influenced his writing, stating “To me you can wrap all of Judaism up in one sentence, and that is, ‘Do not do unto others…’ All I tried to do in my stories was show that there’s some innate goodness in the human condition.” Lee noted his approval when subsequent writers ascribed the Jewish religion to some of his characters. What Jewish activity did a Stan Lee-created character participate in? 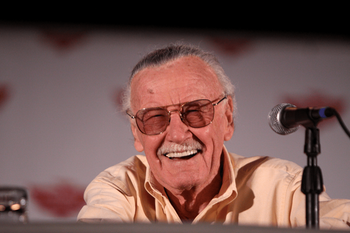 Stan Lee by Gage Skidmore is licensed under CC BY-SA 2.0. A. The Thing, whose real name was Ben Grimm, came upon an unconscious, and seemingly dying, Mr. Sheckerberg, the pawnshop owner he knew. The Thing proceeded to recite the Sh’ma on his behalf, in keeping with Jewish practice. B. Sue Storm, known as the Invisible Woman, was a member of the Fantastic Four. In one story line, she invited the other members of the group to her house, ostensibly to discuss a plan to capture their enemy, The Mole Man. But when they arrived at her house, they found her table set for a Passover seder, and the Fantastic Four celebrated Passover together. C. While Spider-Man is not a Jewish character, in a 1997 edition of the comic, Spider-Man (real name Peter Parker) got married to his longtime girlfriend, Mary Jane Watson. It was revealed the she was Jewish (her original family name was Weitzmann), and the wedding took place under a chuppah. D. Captain Marvel, one of the original members of the Avengers (along with Thor and the Ant-Man), was created by Stan Lee and introduced in 1967. In a 1982 graphic novel, The Death of Captain Marvel, it was revealed that Captain Marvel was Jewish, and he was buried in a Jewish cemetery. E. The Human Torch, one of the founding members of the Fantastic Four, eventually found himself on the outs with the rest of the group, and was replaced by Ant-Man. For a while, the Human Torch turned to alcohol and became homeless. However, at one point he came into contact with the Chabad rabbi in Washington DC, who reminded him of his Jewish roots (the Human Torch’s real name was Nathan Fierstein), and led him on a path to redemption, which included the hiring of the Human Torch to light the candles at the National Menorah lighting across from the White House. Supreme Court Justice Ruth Bader Ginsburg was in the news last week, as she suffered three broken ribs from a fall in her office. What is unique about the chambers of Justice Ginsburg in the Supreme Court building? A. Justice Ginsburg’s chambers is the only room in the Supreme Court building where a seder has been held. In 2007, the court was scheduled to meet on the day of the first seder. Knowing that the session would run relatively late in the day, Justice Ginsburg offered to host a “mini seder” in her chambers, which was attended by the Jewish court clerks, Justice Ginsburg, and the other Jewish justice serving at that time, Stephen Breyer. B. While some other justices have a copy of the Ten Commandments on their wall, only Justice Ginsburg has a copy of the Ten Commandments with the wording and numbering according to Jewish tradition. 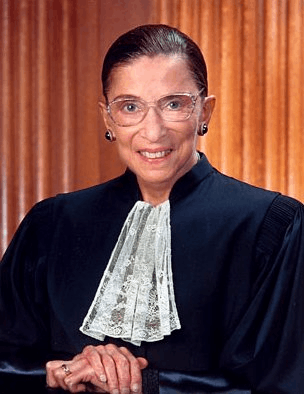 C. The chambers of Justice Ginsburg is the only room in the Supreme Court where a minyan has met. In 2015, one of the lawyers arguing before the court was in a bind, because he was saying shiva for his father, and the court session was running late. The attorney approached the judges and asked if it might be possible to take a fifteen minute break, and his request was granted. Between the lawyers and the court employees present, there were enough Jews for a minyan, and Justice Ginsburg offered her chambers as a site for the service. D. Justice Ginsburg’s chambers is the only room in the Supreme Court building with a mezuzah. E. Justice Ginsburg’s chambers is the only room in the Supreme Court building with a doctor on 24 hour standby, paid for by the Democratic National Committee. Actor Alec Baldwin was in the news last week, as he was arrested for allegedly assaulting a man during a parking dispute. Baldwin has been in the middle of many controversies in the past, including what Israel-related event? Alec Baldwin by Gage Skidmore is licensed under CC BY-SA 2.0. A. The Dominican newspaper El Nacional ran an article about Donald Trump and Israel, following Trump’s comments last year that the Israeli West Bank settlements “don’t help the [peace] process.” The article was accompanied by a picture of Israel Prime Minister Bibi Netanyahu and, inadvertently, a photo of Alex Baldwin, made up as Donald Trump for a Saturday Night Live sketch. B. In 2017, Alec Baldwin performed on Broadway in a production of the play Orphans. The Shubert Organization, which produced the show, planned a one night production of the show in Tel Aviv as a fundraiser to support Israel’s Habima Theatre. 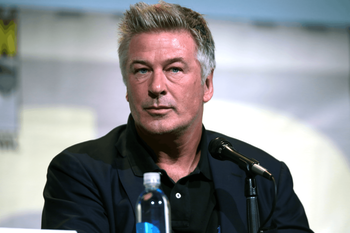 The original cast were all scheduled to perform; however, Baldwin backed out in support of the BDS movement, after he was contacted and pressured by his friend Roger Waters of Pink Floyd, a BDS activist. C. Baldwin visited Israel in 2013 and made an appearance at the Western Wall. He happened to come upon a bar mitzvah celebration, and when the celebrants began dancing a hora around the bar mitzvah boy, a rabbi grabbed Baldwin’s hand and tried to bring him into the circle. Baldwin shoved the rabbi, and police moved in. Baldwin says that he did not realize what was happening and felt threatened when he was grabbed. No charges were filed, and the actor apologized and made a donation to The Western Wall Heritage Foundation, the body responsible for overseeing the area of the Western Wall. E. In the spring of 2016, Alec Baldwin appeared on the Israeli television satire program, Eretz Nehederet, which is often referred to as the Israeli Saturday Night Live. The sketch depicted an actor as Netanyahu, making a phone call to Donald Trump (played by Baldwin), asking Trump for advice on how to handle the media that was regularly attacking him. Baldwin, as Trump, never managed to answer the question, spending the entire time trying to get the Prime Minister’s name right, saying “Shalom, Bubbie, um, Bobby? Bo Bo? Baba Ganoush? Wait, what is it? Bim Bam? Boobies? Well, whatever. Thanks for calling. Bye bye. Oh, is that it? Bye Bye?” It was as a result of this sketch that Baldwin was later hired by SNL to replace Darrell Hammond as their Trump impersonator. Ariana Grande is in the news following the announcement of her breakup with Saturday Night Live cast member Pete Davidson. Grande was raised Catholic, but turned away from the religion because of the theology regarding homosexuality, in solidarity with her gay brother, Frankie. She now studies kabbalah and has been reported to call herself Jewish. 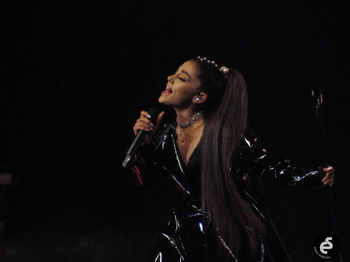 What is another Jewish connection in Ariana Grande’s life? Ariana Grande by Emma is licensed under CC BY-SA 2.0. A. Movie and television executive Steve Tisch, also an owner of the New York Giants, first came to know Ariana Grande when she was on the Nickolodeon show Victorious, where she played the part of Cat Valentine. Tisch was a producer on that show, and later asked Grande to sing the National Anthem for the Giants opening game of the 2016 season. In 2017, Tisch hired Grande to perform as the entertainment at the bar mitzvah of his grandson, Jason, which took place at MetLife Stadium, home field of the Giants. B. Grande grew up in Florida, where she attended the bar and bat mitzvahs of many of her friends, even singing in Hebrew on the bima at her best friend’s bat mitzvah. C. One of Grande’s first performing roles was as a cast member of the Broadway show 13, a show about a Jewish boy, Evan, who moves from New York to a small town in Indiana, shortly before his bar mitzvah. Evan struggles to make new friends (including Charlotte, the cheerleader played by Grande) who will come to his bar mitzvah party. D. Grande was invited to perform in Tel Aviv at a concert in Hayarkon Park in 2016. She wasn’t sure if she should accept this engagement, as she received pressure from people involved in the BDS movement, who threatened a boycott if she sang in Israel. However, Grande had recently begun dating rapper Mac Miller, who was Jewish, and he convinced her to make the trip. The concert was attended by more than 45,000 people. E. Grande’s best friend growing up was the granddaughter of Howard Schultz, former CEO of Starbucks. Schultz met Grande at his granddaughter’s bat mitzvah party, where Ariana sang a song for her best friend. Schultz went on to name the 16 ounce size of coffee at Starbucks after Ariana. Lotto fever has hit the country, as the Mega Millions first prize in this week’s drawing will be at least $1.6 billion, an all-time high amount. Israel offers its own lottery, known as Mifal HaPayis, with a variety of games including a bi-weekly 7-number drawing, as well as a keno-type game, a daily 3-digit game, and scratch-offs. Which of the following is a true story about the Israeli Mifal HaPayis lottery? 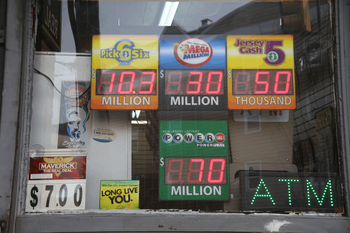 Lotto by Paul Sableman is licensed under CC BY 2.0. A. The name “Mifal HaPayis” means “The Side Curl Enterprise,” referencing the side curls, or payis, of Chassidic men. The name was chosen when the lottery was first established in Israel in 1951 to provide funding for young Chassidic men who were studying at yeshivas, and who in most cases did not have income-producing jobs. (Today Mifal Hapayis supports schools, hospitals, parks, performing arts, and many other community resources). B. Waze, the navigation app, is one of the most successful GPS applications in the world. The software was originally developed in 2006 by Israeli programmer Ehud Shabtai, as a school project at the Israeli Technion University, where he was studying. While he hoped to find funding to enable him to turn his project into a marketable application, he had been unsuccessful until he happened to win NIS 20,000 (equivalent to $5200) in a Mifal Hapayis drawing, a contest he had been entering weekly for years. He was able to utilize those winnings to set up a small company, finalize the app design, and begin offering Waze in the iTunes store. In 2013 Waze was purchased by Google for $966 million. D. One of the games sponsored by Mifal Hapayis is the 123 Daily Draw game, in which players must correctly choose three numbers between 0 and 9, in the correct order in which they were drawn. On September 14, 2009, this game set a record for the largest number of winning tickets ever sold for a single game, as more than 629,000 people selected the winning numbers of 6, 1, and 3, causing a huge financial loss that week for the lottery. Apparently, because the numbers 6, 1, and 3 correspond to the number of commandments in the Torah, tickets with these numbers are sold in staggeringly huge quantities compared to any other number combination. E. As in the United States, winners of huge Mifal Hapayis payouts appear on Israeli television for a press conference. However, unlike in the United States where most states require the winners to come forward publicly, Mifal Hapayis wants to protect the privacy of its prize winners, while still presenting a press conference as part of their marketing approach. Therefore Mifal Hapayis officials provide large welder-type masks to the winners, who appear live on TV wearing this strange head gear. Tensions are rising in the Middle East, as Turkey has accused Saudi Arabia of murdering a Turkish reporter inside the Saudi embassy in Istanbul. There is a long Jewish history in Turkey, going back to at least the 5th century BCE. And according to some theories, Noah’s ark came to rest on Mt. Ararat in Turkey. Dr. Eran Elhaik, of the University of Sheffield in England, claims that a significant percentage of world Jewry has roots that can be traced to an area of northwest Turkey. His research is based on genetic and historical evidence, but in addition, Dr. Elhaik notes that there are three villages near each other in this part of Turkey that are indicative of the Jewish roots of the area. What are the names of the three towns? Map of Turkey by sk is licensed under CC BY-ND 2.0. A. Sephardaz, Turkey; Tzafartaz, Turkey; and Sephardekez, Turkey. B. Iskenaz, Turkey; Eskenaz, Turkey; and Ashanaz, Turkey. C. Abrahamaz, Turkey; Isakaz Turkey; and Jacobez, Turkey. D. Davidaz, Turkey; Shlomaz, Turkey; and Shaulez, Turkey. E. Wild, Turkey; Cold, Turkey, and Empire, Turkey. A primary part of the celebration of the Sukkot holiday is the practice of holding and shaking the lulav and etrog. The lulav consists of three parts–branches from the palm tree, the willow, and the myrtle. 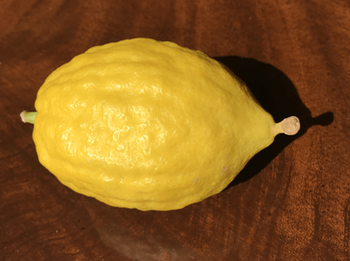 The etrog is a citrus fruit similar in appearance to a lemon. The etrog, also known as the citron, was first cultivated in the Far East, possibly making its way to the Mediterranean region around 300 BCE via the armies of Alexander the Great. What controversy about etrogim (plural for etrog) became known as the Etrog Wars? A. The “war” was between the Pharisees and the Sadducees in ancient Israel, during the time of the 2nd Temple. The only mention of the etrog in the Torah is in Leviticus 23:40, which references pri etz hadar or “the fruit of a beautiful tree.” The Pharisees used the citron during their ceremonies, while the Sadducees used the pomegranate. Members of the two communities almost came to blows during the celebration of Sukkot at the Temple, with each vying for the primacy of their fruit as the most beautiful. Ultimately, however, the approach of the Pharisees won out as the Sadducees community disappeared following the destruction of the Temple. D. The “war” was between the House of Hillel and the House of Shammai. They were debating the proper holding of the lulav and etrog. Hillel stated that because the lulav consisted of three items, it reflected three mitzvot, rather than the single mitzvah of the etrog. Therefore, the lulav should be held in the right hand, which was considered to be the more important hand. Shammai, who was left handed, stated that the lulav should be held in whichever hand was the dominant hand of the person, arguing that the more important hand was not always the right hand, but rather the individual’s dominant hand. 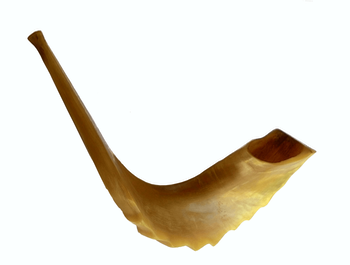 As with most disputes between Hillel and Shammai, the predominate practice today is to hold the lulav in the right hand, per Hillel’s argument. E. The “war” was between the Chabad community in Paris and a French car manufacturer. Prior to Sukkot, Jews everywhere, and in particular, Chassidic Jews, devote hours to shopping for the most beautiful etrog. Every year since 1983, Chabad of Paris has opened an etrog store in the weeks prior to Sukkot, where thousands of Jews come to make their holiday purchase. The store goes by its French name, Le Magasin Citroën, the citron store. In 1987, the auto manufacturer Citroën filed a lawsuit claiming that the store name violated their trademark. For the trial, Chabad purchased a Citroën car, painted it to look like an etrog, and parked it outside the courthouse, inviting passers-by to shake a lulav and etrog. The judge ultimately ruled in favor of Chabad, and Le Magasin Citroën has since then opened every year at Sukkot with an etrog-painted Citroën parked in front. In 1998, Rabbi Shalom Greenberg and his wife Dina moved to Shanghai, China where they established the Shanghai Jewish Center under Chabad auspices. Since then the rabbi has overseen the growth of the local Jewish community and catered to the needs of visiting Jewish travelers, business people and students. His interactions with the local Chinese community have occasionally been complicated. What incident related to Sukkot caused a problem for Rabbi Greenberg in dealing with the local Chinese population? A. In 1998 Rabbi Greenberg was cutting down bamboo that was growing wild along a stream near his house, intending to use it as schach, the roof covering for his sukkah. He did not know that it is illegal to cut down bamboo in China unless one has a license, and was arrested and brought before the Local People’s Court. He was released after paying a fine of 100 yuan (approximately $14.00), and every year since then he has obtained a license before the holiday. C. Since arriving in Shanghai Rabbi Greenberg had been erecting a traditional sukkah every year. In 2010, he decided to alter the sukkah design slightly by adding upturned “flying eaves,” to the roof corners, as an homage to the local architecture found on Chinese temples. The rabbi was contacted by local Buddhist leaders who explained to him that his sukkah was actually an offense as it was inappropriate to utilize elements of their holy temple on a building used for religious purposes that were foreign to Buddhism. 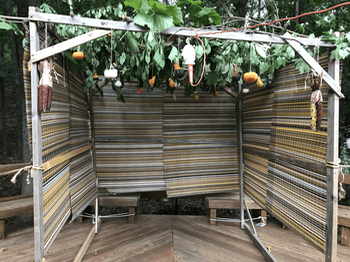 As a result, the rabbi rebuilt his sukkah, and the following year, he made a point of inviting local Buddhist leaders to dine in his sukkah and share information about the two religions. D. When Rabbi Greenberg built a sukkah in 1998, the first time he was in Shanghai for Sukkot, he was brought before local authorities at the Public Security Bureau who investigated him for building an “underground church” for the purpose of illegal proselytizing activity. Rabbi Greenberg agreed to take down the sukkah (which he delayed doing until the end of the holiday). Subsequently he was able to educate local authorities and convince them that the tiny size of the Chinese Jewish community was proof that Jews were not a proselytizing religion and he has since been allowed to build a sukkah every year. E. Rabbi Greenberg’s landlord noticed that the rabbi was sleeping in his sukkah and thought that he and his wife were having a marital dispute and possibly planning to divorce. When the rabbi moved back inside at the end of the holiday the neighbors rejoiced. Neilah is the closing service at the end of Yom Kippur. The service includes many of the same traditional liturgical prayers chanted throughout the High Holidays, including Ashrei, Selichot, and Avinu Malkeinu. Unique to Neilah is the chanting of the El Nora Alila, a Sephardic hymn attributed to Moses ibn Ezra. Within the Chabad Lubavitcher movement, there is a tradition wherein their congregations break into song at the end of Neilah with an unusual song choice. What song do they chant? A. Wedding March in C major, by Felix Mendelssohn, grandson of Jewish philosopher Moses Mendelssohn. B. Napoleon’s March, which was played by Napoleon’s armies as they invaded Russia in 1812. C. Hallelujah, by Leonard Cohen. D. Lamentations of Jeremiah, by 16th century British composer Thomas Tallis. E. Feed Me from Little Shop of Horrors.